With the recent flurry of M&A activity in the orthopaedic implant space, there’s a buzz about what we can expect to see in the market. More accurately, there is a buzz about the fact that we have no idea what to expect. It’s a funny sounding term, sure – like a name Hasbro is considering for an off-shoot of Monopoly. However, it’s serious and something we are all familiar with. 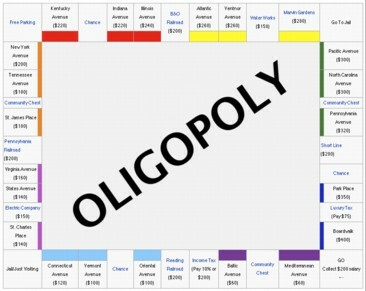 An oligopoly is a situation in which a particular market is controlled by a small group of firms. A great example of this is the mid-twentieth century US auto market. GM, Ford, Chrysler. If you weren’t driving one of those brands in the 50s, 60s, or 70s, you were very wealthy, opting for a British or German badge representing a fraction of the market. Thankfully for the consumer, US automakers did not respond quickly enough to the oil crisis, letting a little Japanese company called Honda crack the code to entry. From there, the US market has seen an increasing number of manufacturers compete to provide the best in quality, value and price and the US consumer has been better off for it. So what impact do oligopolies have? For one, price protection. Ample supply of a goods typically drives prices down under normal market conditions. With an oligopoly present, there is no real pressure to lower prices. In other words, price operates independently of supply and demand when a few players control the market. With only a few sellers, a drive toward better quality is lost as well. Let’s look back at those behemoths that ruled the roads way back when – by the 70s, quality in build and design was terrible. Thin cheap plastics and vinyl had taken over where enameled and chrome surfaces once had flourished. Every car, barring outliers like the Corvette, were indistinguishable boats. And technology? They moved the gas tank cap from the side of the car to behind the rear license plate…..a bold move with as much staying power as the Ford Pinto. But as quality was sacrificed, prices never came down. As the public, we had no choice but to pay more for less. However, there is a silver lining to every dark and ominous cloud. The big US automakers had given up their edge just enough to let that little Honda squeak in and we are all better for it. One could argue that with the consolidation in the medical device industry, that just enough focus on quality and price will be lost, giving the smaller value-focused players the opportunity to break the seal. And as that exit sign from the overpriced super highway leads the way to value town, people are starting to feel the wheel turn for it.